No, this is not the last time I’ll write about Phonathon, but after today I promise to give it a rest and talk about something else. I just wanted to round out my post on the waste I see happening in donor acquisition via phone programs with some recent findings of mine. Your mileage may vary, or “YMMV” as they say on the listservs, so as usual don’t just accept what I say. I suggest questions that you might ask of your own data — nothing more. I’ve been doing a thorough analysis of our acquisition efforts this past year. (The technical term for this is a WTHH analysis … as in “What The Heck Happened? ?”) I found that getting high phone contact rates seemed to be linked with making a sufficient number of call attempts per prospect. For us, any fewer than three attempts per prospect is too few to acquire new donors in any great number. In general, contact rates improve with call attempt numbers above three, and after that, the more the better. You’re right — I did. It doesn’t make sense to have a limit. But it might make sense to have a minimum. To get anything from an acquisition segment, more calling is better. However, by “call more” I don’t mean call more people. I mean make more calls per prospect. The RIGHT prospects. Call the right people, and eventually many or most of them will pick up the phone. Call the wrong people, and you can ring them up 20, 30, 50 times and you won’t make a dent. That’s why I think there’s no reason to set a maximum number of call attempts. If you’re calling the right people, then just keep calling. What’s new here is that three attempts looks like a solid minimum. This is higher than what I see some people reporting on the listservs, and well beyond the capacity of many programs as they are currently run — the ones that call every single person with a phone number in the database. To attain the required amount of per-prospect effort, those schools would have to increase phone capacity (more students, more nights), or load fewer prospects. The latter option is the only one that makes sense. Reducing the number of people we’re trying to reach to acquire as new donors means using a predictive model or at least some basic data mining and scoring to figure out who is most likely to pick up the phone. I’ve built models that do that for two years now, and after evaluating their performance I can say that they work okay. Not super fantastic, but okay. I can live with okay … in the past five years our program has made close to one million call attempts. Even a marginal improvement in focus at that scale of activity makes a significant difference. You don’t need to hack your acquisition segment in half today. I’m not saying that. To get new donors you still need lots and lots of prospects. Maybe someday you’ll be calling only a fraction of the people you once did, but there’s no reason you can’t take a gradual approach to getting more focused in the meantime. Trim things down a bit in the first year, evaluate the results, and fold what you learned into trimming a bit more the next year. What do we do about Phonathon? I love Phonathon. I love what it does, and I love the data it produces. But sad to say, Phonathon may be the sick old man of fundraising. In fact some have taken its pulse and declared it dead. A number of people immediately came to the defence of Phonathon with assurances of the long-term value of calling programs. The responses went something like this: Get rid of Phonathon?? It’s a great point of connection between an institution and its alumni, particularly its younger alumni. It’s the best tool for donor acquisition. It’s a great way to update contact and employment information. Don’t do it! I can’t disagree with Audra. Anyone following fundraising listservs knows that, in general, contact rates and productivity are declining year after year. And out of the contacts it does manage to make, Phonathon generates scads of pledges that are never fulfilled, entailing the additional cost of reminder mailings and write-offs. There are those who say that Phonathon should be viewed as an investment and not an expense. I have been inclined to that view myself. The problem is that yes, it IS an expense, and not a small one. If Phonathons create value in all the other ways that the defenders say they do, then where are the numbers to prove it? Where’s the ROI? Audra had numbers; the defenders did not. At strategic planning time, numbers talk louder than opinions. When I contacted Audra recently to get permission to use her name, she told me she has opted to keep her Phonathon program for now, but will market its services to other university divisions to turn it into a revenue generator (athletics and arts ticket sales, admissions welcome calls, invitations to events, and alumni membership renewals). That sounds like a good idea. I can think of a number of additional ways to keep Phonathon alive and relevant, but since this is a data-related blog I will focus on just two. We know that people who have attended events are more likely to pick up the phone. We know that alumni who have shared their job title with us are more likely to pick up the phone. 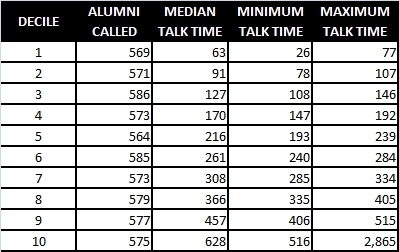 We know that alumni who have given us their email address are more likely to pick up the phone. So why in 2013 are schools still expending the same amount of energy on each of their prospective donors as if they were all exactly alike? They are NOT all alike, and these schools are wasting time and money. 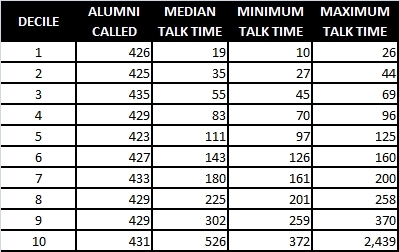 If you’ve got automated calling software, you should be adding up the number of times you’ve successfully reached individual alumni over the years (regardless of the call result), and use that data to build predictive models for likelihood to answer the phone. If you don’t have that historical data, you should at least consider an engagement-based scoring system to focus your efforts on alumni who have demonstrated some of the usual signs of affinity: coming to events, sharing contact and employment information, having other family members who are alumni, volunteering, responding to surveys and so on. A phone contact propensity score (and related models such as donor acquisition likelihood) will allow you to make cuts to your program when and if the time comes. You can feel more confident that you’re trimming the bottom, cutting away the least productive slice of your program. Your phone program is a data generation machine, granting you a wide window view on the behaviours of your alumni and donors. I’m not talking just about address updates, as valuable as those are. You know how many times they’ve picked up the phone when they see your ID come up on the display, and you might also know how long they’ve spent on the phone with your student callers. This is not trivial information nor is it of interest only to Phonathon managers. Relate this behavioural data to other desired behaviours: Are your current big donors characterized by picking up more often? Do your Planned Giving expectancies tend to have longer conversations on average? What about volunteering, mentoring, and other activities? Phone contact history is real, affinity-related data, delivered fresh to you daily, lifting the curtain on who likes you. I said earlier that Phonathon has been used (or misused) as a mass-contact tool. Software and automation enables a hired team of students to make a staggering number of phone calls in a very short time. The bulk of long-lapsed and never-donors are approached by phone rather than mail: The cost of a single call attempt seems negligible, so Phonathon managers spread their acquisition efforts as thinly as possible, trying to turn over every last stone. There’s something to be said about having adequate volume in order to generate new donors, but here’s the problem: The phone is no longer a mass-contact medium. In fact it’s well on its way to becoming a niche medium, handled by a whole new type of device. Some people answer the phone and respond positively to being approached that way, and for that reason phone will be important for as long as there are phones. But the masses are no longer answering. These days some fundraisers think of email as their new mass-contact medium of choice. Again they must be thinking in terms of cost, since it hardly matters whether you’re sending 1,000 emails or 100,000 emails. And again they’re mistaken in thinking that email is practically free — they’re just not counting the full cost to the institution of the practice of spamming people. The truth is, there is no reliable mass-contact medium anymore. If email (or phone, or social media) is a great fundraising channel, it’s not because it’s a seemingly cheap way to reach out to thousands of people. It’s a great fundraising channel when, and only when, it reaches out to the right people at the right time. Alumni and donors are not all the same. They are not defined by their age, address or other demographic groupings. They are individual human beings. They have preferred channels for communicating and giving. These preferences are revealed only through observation of past behaviours. Not through self-reporting, not through classification by age or donor status, not by any other indirect means. We cannot know the real preferences of everyone in our database. Therefore, we model on observed past behaviours to make intelligent guesses about the preferences we don’t already know. Our models are an improvement on current practice, but they are imperfect. All models are wrong; we will make them better. And we will keep Phonathon healthy and productive. Comments Off on What do we do about Phonathon? Sometimes I employ a practice in our Phonathon program simply because my gut says it’s gotta work. Some things just seem so obvious that it doesn’t seem worthwhile testing them to prove my intuition is valid. And like a lot of people who work in Annual Giving, I like to flatter myself that I can make a non-engaged alum give just by making shrewd tweaks to the program. It turns out that I am quite wrong. I am thinking about a practice that seems to be part of the Phonathon gospel of best practices. I firmly believed in it, and I got serious about using it this fall. As the song says, though, it ain’t necessarily so. When possible, I am pairing up student callers with alumni whose degree is in the same faculty of study. If I have business students in the calling room, for example, I’ll assign them alumni with degrees associated with the Faculty of Management. A grad with a BSc majoring in chemistry, meanwhile, will get a call from a student majoring in one of the sciences, rather than arts or business. It’s not perfect: There are too many degree programs, current and historic, for me to get any more specific than the overall faculty, but at least it increases the chance that student and alum will have something in common to talk about. It’s easy to see why this ought to work. When speaking with young alumni, callers are somewhat more likely to have had certain professors or classes in common, and their interests may be aligned — for example, the alum might be able to provide the student with a glimpse into the job market that awaits. With older alumni, the callers might at least know the campus and buildings that alumni of the past inhabited just as they do today. If alumni feel so inclined, the conversation might even lead to a discussion about life and career. These would be meaningful conversations, the kind of connection we hope to achieve on the phone. Just that much, even without a gift (this year), would be a desirable result. On the other hand … if faculty pairings really lead to longer, better-quality conversations, would we not expect that faculty-paired conversations would, on average, result in more gifts than non-paired conversations? In the long run, is that not our goal? If it makes no difference who asks whom, then why complicate things? First let me say that I embarked on this analysis fully expecting that the data would demonstrate the effectiveness of faculty-paired conversations. I might be a data guy, but I am not unbiased! I really hoped that my intervention would actually produce results. Allow me to admit that I was quite disappointed by what I found. Last year, I did not employ faculty pairings. We made caller assignments based on prospects’ donor status (LYBUNT, SYBUNT, etc. ), but not faculty. I don’t know how our automated software distributes prospects to callers, but I am comfortable saying that, with regards to the faculty of preferred degree, the distribution to callers was random. 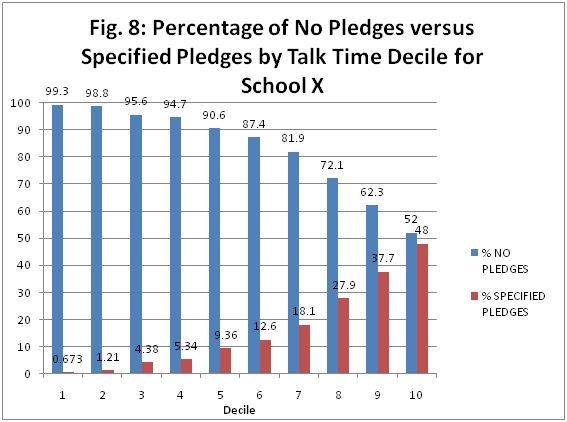 This more or less random assignment by faculty allowed me to compare “paired” conversations with “unpaired” conversations, to see whether one was better than the other with regards to length of call, participation rate, and average pledge. I dug into the database of our automated calling application and I pulled a big file with every single call result for last year. The file included the caller’s ID, the length of the call in seconds, the last result (Yes Pledge, No Pledge, No Answer, Answering Machine, etc. etc. 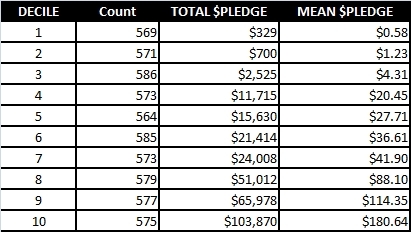 ), and the pledge amount (if applicable). Then I removed all the records that did not result in an actual conversation. If the caller didn’t get to speak to the prospect, faculty pairing is irrelevant. I kept any record that ended in Yes Pledge (specified-dollar pledge or credit card gift), Maybe (unspecified pledge), No Pledge, or a request to be put on the Do Not Call list. I added two more columns (variables) of data: The faculty of the caller’s area of study, and the faculty of the prospect’s preferred degree. Because not all of our dozen or so faculties is represented in our calling room, I then removed all the records for which no pairing was possible. For example, because I employed no Law or Medicine students, 100% of our Law and Medicine alumni would end up on the “non-paired” side, which would skew the results. As well, I excluded calls with call lengths of five seconds or less. It is doubtful callers would have had enough time to identify themselves in less than five seconds — therefore those calls do not qualify as conversations. In the end, my data file for analysis contained the results of 6,500 conversations for which a pairing was possible. Each prospect record, each conversation, could have one of two states: ‘Paired’ or ‘Unpaired’. About 1,500 conversations (almost 22%) were paired, as assigned at random by the calling software. I then compared the Paired and Unpaired groups by talk time (length of call in seconds), participation, and size of pledge. Better rapport-building on the phone implies longer, chattier calls. According to the table, “paired” calls are indeed longer on average, but not by much. A few seconds maybe. The donor rates you see here are affected by all the exclusions, especially that of some key faculties. However, it’s the comparison we’re interested in, and the results are counter-intuitive. 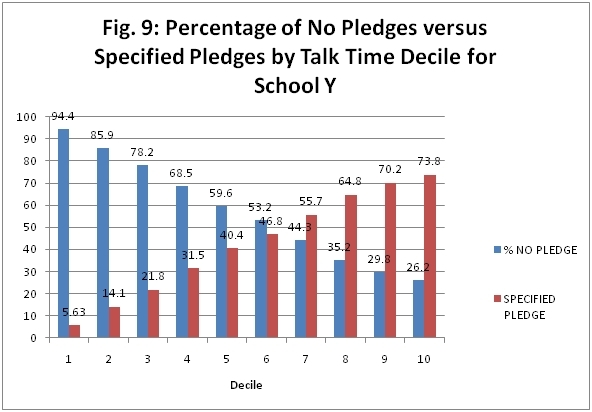 Non-paired conversations resulted in a slightly higher rate of participation (number of Yes Pledges divided by total conversations). 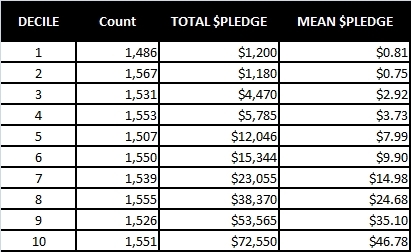 This table is also affected by the exclusion of a lot of alumni who tend to make larger pledges. 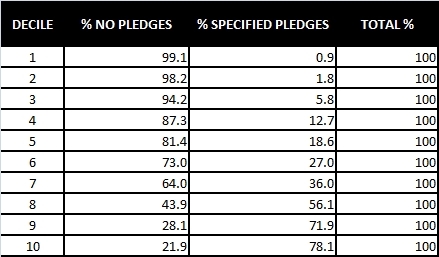 Again, though, the point is that there is very little difference between the groups in terms of the amount given per Yes pledge. The differences between the groups are not significant. Think about the range of values your callers get for common performance metrics (pledge rate, credit card rate, talk time, and so on). There are huge differences! If you want to move the yardsticks in your program, hire mature, friendly, chatty students who love your school and want to talk about it. Train them well. Keep them happy. Reward them appropriately. Retain them year over year so they develop confidence. These are the interventions that matter. Whom they are assigned to call doesn’t matter nearly as much. 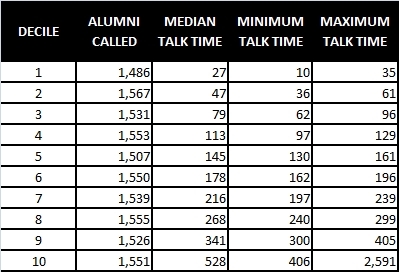 Over and above that, pay attention to what matters even more than caller skills: The varying level of engagement of individual alumni. Call alumni who will answer the phone. Call alumni who will give a gift. Stop fussing over the small stuff. But my study has cast doubt on the usefulness of going to any great length to target alumni by faculty. For example, should I try hard to recruit a student caller from Law or Medicine to maximize on alumni from those faculties? Probably not. Finally, I caution readers not to interpret my results as being generally applicable. I’m not saying that faculty pairing as a best practice is invalid. You need to determine for yourself whether a practice is part of your core strategy, or just a refinement, or completely useless. As I opined in my previous post (Are we too focused on trivia? ), I suspect a lot of Annual Fund professionals aren’t making these distinctions. The answers are in the data. Go find them. Back in January of this year, the three of us posted a paper based on calling data from one higher education institution (Time on the call and how much the alum pledges). 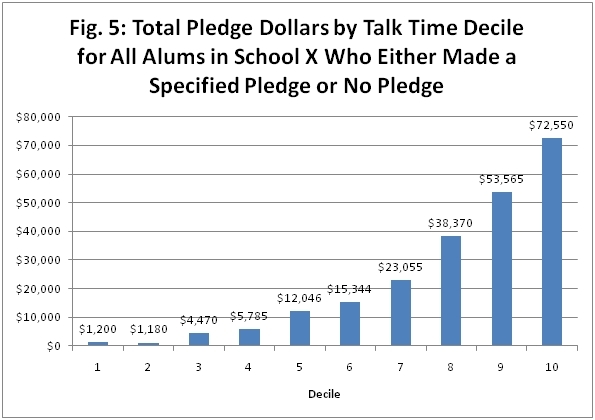 You can go back and take a look at the paper, but its essence is the strong relationship we saw between time spent on a call to an alum, and whether or not that alum made a pledge and how big the pledge was. We weren’t bowled over by these findings, but we were certainly intrigued by them. 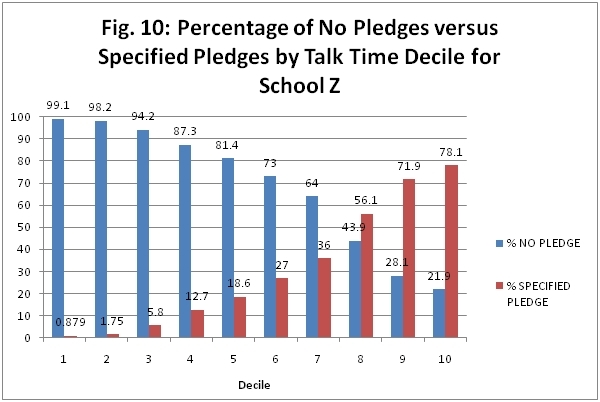 In this paper we’ve got some more data to show you — data that provides “corroborative testimony” for that relationship between calling time and pledging. And we’ve got something a little bit extra for you, too. 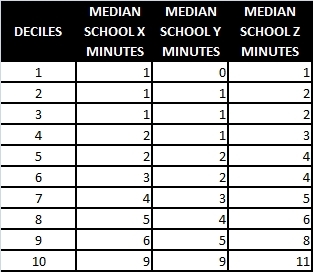 Tables 1 – 3 show the calling time in seconds for the three schools (X,Y, and Z) that we looked at. Notice that we divided the alums called at each school into ten groups (called deciles) of approximately equal size. These three tables convey a lot of information that we think is worth looking through carefully. On the other hand, sometimes it’s just easier to look at a quick summary. 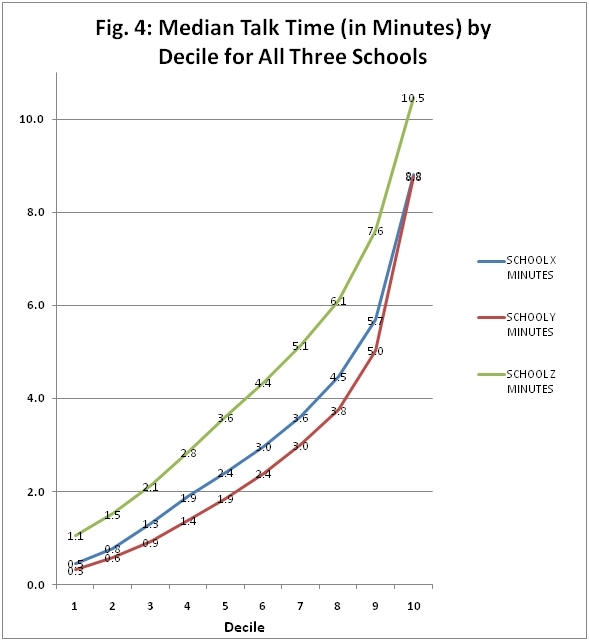 And that’s what you’ll see in Table 4 and Figure 4; both show the median talk time (in minutes, not seconds) by decile for the three schools. 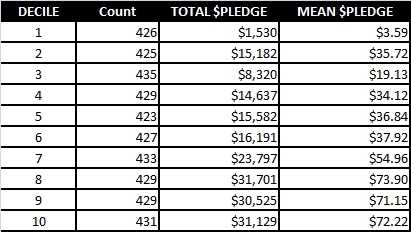 Now let’s look at the pledge money that was received from alums in the three schools by our time on the call deciles. It’s laid out for you in Tables 5-7 and Figures 5-7. So far we’ve confirmed some of the findings from our January paper. But what about the extra we promised? 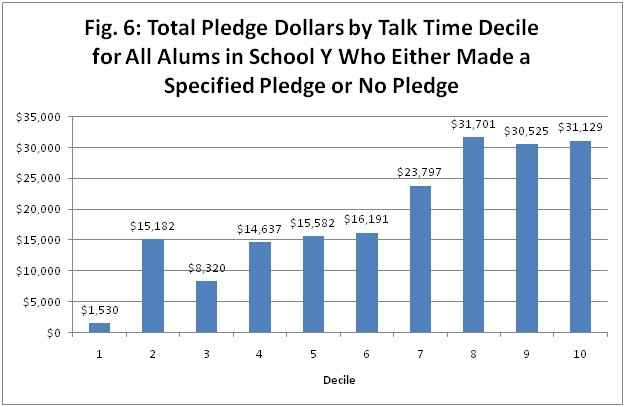 You’ll recall that the alums we looked at in this study were ones who had (on the last call made to them) either agreed to make a pledge, or who had told the caller they would not make a pledge. Take a look at Tables 8-10 and Figures 8-10. They show the percentage of alums at each decile who chose either option. As is often the case with data analysis, we sort of happened upon what you’ve just seen in these table and charts. We were looking at outcomes that were related to call length. We didn’t plan to look only at alums who either said they’d give a pledge or, “Nope, can’t help you out.” The thought just occurred to us as we were looking at lots of different possibilities. But look at what popped out. It almost appears as if we fudged the data. But we didn’t. We are far from ready to tell call center managers: “Tell your callers to try to keep the alum on the phone as long as they can. 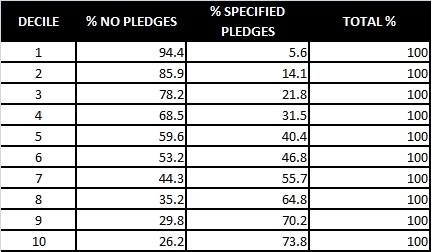 If they do that, both your pledge rates and pledge amounts will go up dramatically.” It would be nice if things were that simple, but, of course, they are not. 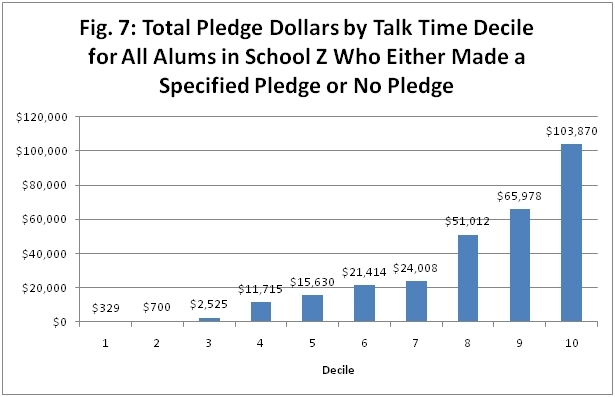 Some alums are quite willing to give a healthy pledge, and the last thing they want to do is yak on and on with a kid who went to a place they graduated from when people used rotary phones. Some callers are naturally chatty and engaging, as are some alums. Others are not. Humans beings are complicated creatures and they vary enormously. One size fits all advice is almost always unhelpful for dealing with them. Great idea. Let’s hear some more from you all.